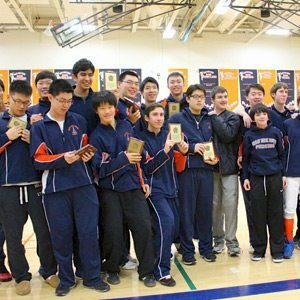 Boys’ coach Josh Baravarian feels that the Great Neck South High School fencing teams have created an envious record in recent years and his counterpart, girls’ coach Catie Sagevick, agrees. The two coaches point with pride to their school’s seven Nassau titles in the past nine years and the teams’ additional successes during the just-completed season. The Rebels defeated Oyster Bay, 14-12, earlier in the month to win the boys’ county title. The Oyster Bay match was the fifth year in a row that the two teams met in the Nassau final. Great Neck has won three of the meetings. Although the team lost to Ward Melville in the Island-wide final, they delivered strong performances at every level. Proud of the students’ efforts, the coaches made sure to also credit adults’ contributions. “The unsung heroes of our fencing teams are the parents,” says Baravarian, who has now led the Rebels to two straight Nassau County championships in four years of coaching. The boys won four straight titles from 2006 through 2010 and the girls won in 2011. For Sagevick, who fenced during high school in Garden City’s very strong program, and later in college for Sacred Heart in Connecticut, this was her first year coaching at Great Neck. Her team’s loss in the semi-final Nassau competition to Garden City was disappointing but a step forward for the program. Great Neck had beaten the eventual Nassau winner earlier in the season. She gives a lot of credit to Baravarian for the current state of the program. Skyler Chin, a junior, continued to excel this year for Baravarian. “He’s reliable and calm and cool under pressure,” the coach said. Chin’s career record is now 74-4 and he was the gold medalist (epee) in the county individuals and was named to the All-Long Island team for the second year in a row. His teammate senior Alex Hall was the runner-up to Chin in the individuals. Junior Kody Horiuchi was the gold medalist in the foil and was also named to the All-County team while Andy Shu, another senior, went 17-1 for the season and was selected for the All-Long Island team. Sophomore Vera Lin (28-1) won the county championship (epee) and achieved All-County and All-Long Island honors. Teammate Kelly Gragossian, another sophomore, was also named to both of those teams. Macy Meng (26-5), only a freshman, was selected for the All-County team. Both coaches are optimistic about continuing success next season and beyond. “We always have good young kids coming up,” said Baravarian, even though six of his nine starters are graduating.